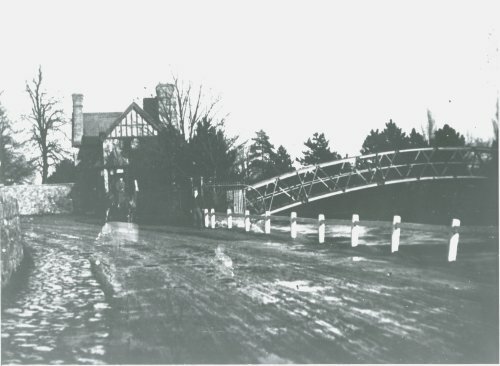 The iron bridge at Santa Maria Lodge was built for the horses and hounds to cross the River Soar and exercise in the fields. The lodge was built by Edward Charles Warner in 1880 and the initials E C W and 1880 are inscribed on the gable. It was built as the front lodge for Quorn Hall with windows facing all directions so that a watch could be kept for people approaching Quorn Hall and the gates opened. The entrance to Quorn Hall went through the present granite wall and the drive crossed the garden of Santa Maria Lodge to the front of Quorn Hall. It is not known how Santa Maria Lodge acquired its present name - a possibility is thought to be that a previous owner, a Mrs Freeman, chose the name - she was a staunch Roman Catholic.